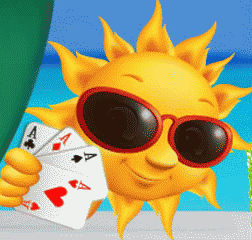 NordicBet Poker is running the €10,000 Summer Race freeroll in July. All you have to do is rake at least €200 throughout July and you will be qualified for the freeroll. The format is the same as the freeroll in June, just with a different name. The tournament can be located under Scheduled Tournaments → Special in the NordicBet Poker game client. Players who qualify will be automatically registered. Please note if you are inactive through the first 15 minutes your stack will be removed.